SUNfarming Food & Energy concepts provide jobs and education, food and energy and infrastructure where they are urgently needed. European technologies and through PPP partnerships with the industry, long-term and reliable management of the projects, ensure the investment. Sustainable solar energy and regional food are produced together – on the same area. With SUNfarming’s “Food & Energy Training Concept”, we are intensifying our efforts not only to provide environmentally-friendly energy security through solar PV, but at the same time offer our agro-solar technologies the opportunity to contribute to sustainable food supply and to combat unemployment and to help people in training. On site, SUNfarming Food & Energy facilities could uniquely contribute to the sustainable improvement of the living conditions of people in developing countries and crisis regions. SUNfarming has developed the unique “Food & Energy Urban Concept”: sustainable solar energy and regional food are produced together – on the same place. 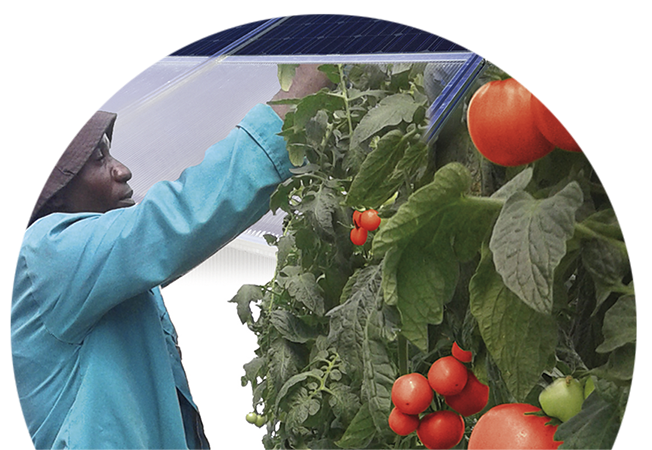 In addition to the solar power, vegetable, fruit or flowers can be grown regionally in new or already built special agro-solar food & energy greenhouses or in PV open spaces. With the SUNfarming self-current concept, we have been supplying green electricity from our own PV plants to local authorities, commercial and industrial companies for years and can offer a price saving of approx. 10% below the market price.